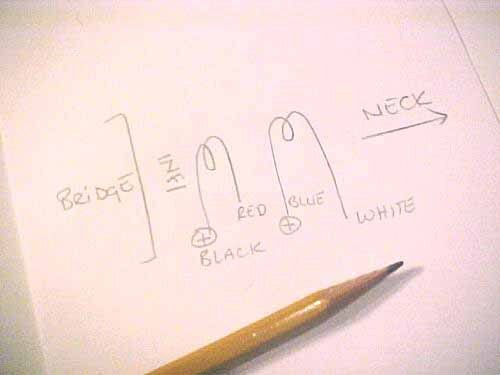 Colour-coding on pickup wires is not always a known; being able to determine the correct way to wire up a four-conductor is crucial in getting the pickup to work as expected. More often than not, I work with a mix of old pickups on a single guitar and no two color codes ever seem to be alike from one pickup to the next. 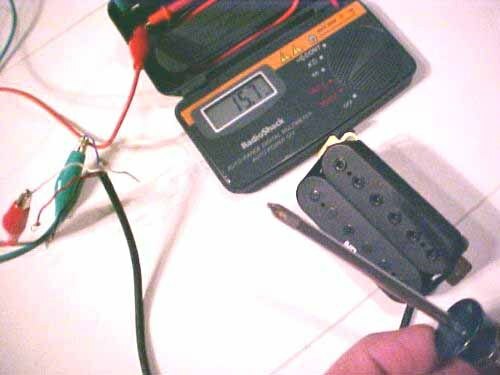 Given a pickup with an unknown color code for the wires, there are many ways to solder it in the guitar wrong and only one way to get it right. This is a technique that I use to figure out the color code for any pickup, and to make sure that I get all the pickups installed in-phase. 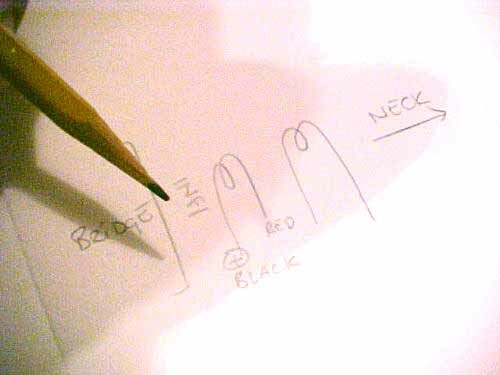 The first thing I do is draw a simple picture of the pickup as it would be in the guitar. I draw two coils and note where the bridge is and where the neck is. That may seem silly, but it helps me to visualize what I'm doing. This also is a big help later for when I actually install the pickup in the guitar. 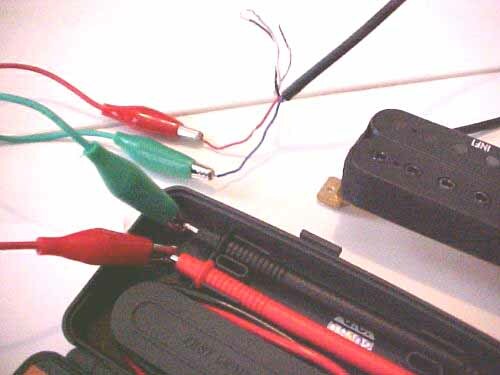 With the alligator clip leads, I connect the voltmeter to two wires on the pickup. For this pickup I have a bare ground wire, plus Blue, Red, White, and Black. Just as a guess I tried Red and Blue first. The voltmeter is set to read VDC (Volts DC). 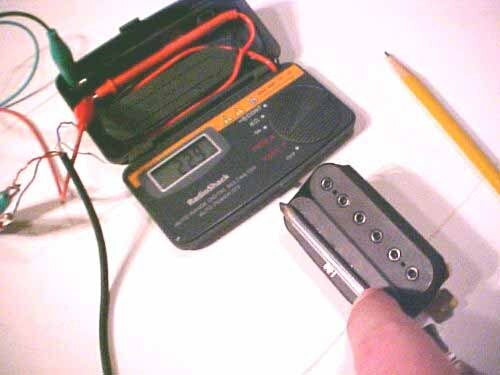 To test each coil, tap the long side of a metal screwdriver all along the magnets on the top of one coil. Give it one good tap and watch the voltmeter. The Red and Blue wires didn't show any reading on the meter when I tapped either of the coils. This means that those two wires do not go together. I tried the Red and Black wires next. Now, when I tap the coil closest to the bridge, I get a positive reading. When I pull the screwdriver off, I get a negative reading. This tells me that I have the Red and Black wires in-phase for that coil. 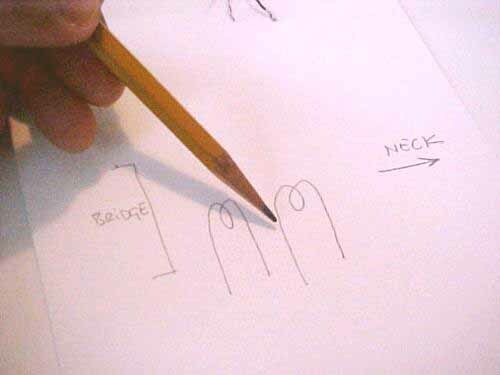 I make a note on my drawing. I know that the White and Blue wires are for the other coil, but I do not know what the correct phase is. I alligator clip the probes to the White and Blue wires and tap the coil closest to the neck now. 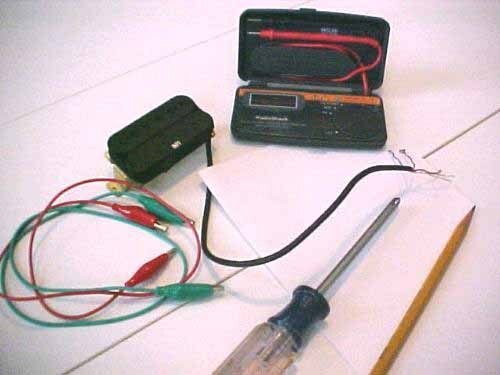 When I tap the coil with the screwdriver, I get a negative reading on the voltmeter. When I pull the screwdriver off the coil, I get a positive reading. This tells me that I have the coil is hooked up out-of-phase. I just flip the colors and put that on my notes. 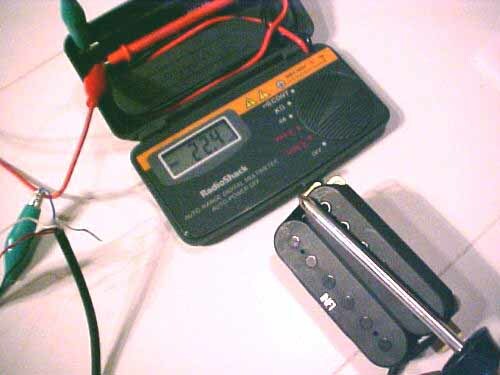 How To Determine The Color Code For A Humbucker by Bill Jehle is licensed under a Creative Commons Attribution-NonCommercial-ShareAlike 4.0 International License.